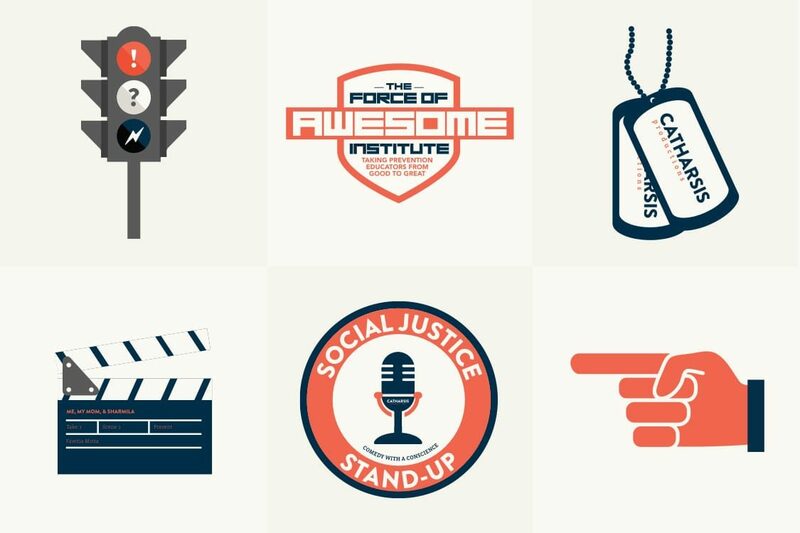 Catharsis Productions offers educational programs centered around reducing interpersonal violence using humor, relatability, and research. Catharsis Productions’ mission is to create a world without violence. By focusing on artistically innovative and research supported programming, they are successfully educating audiences on how to reduce interpersonal violence. 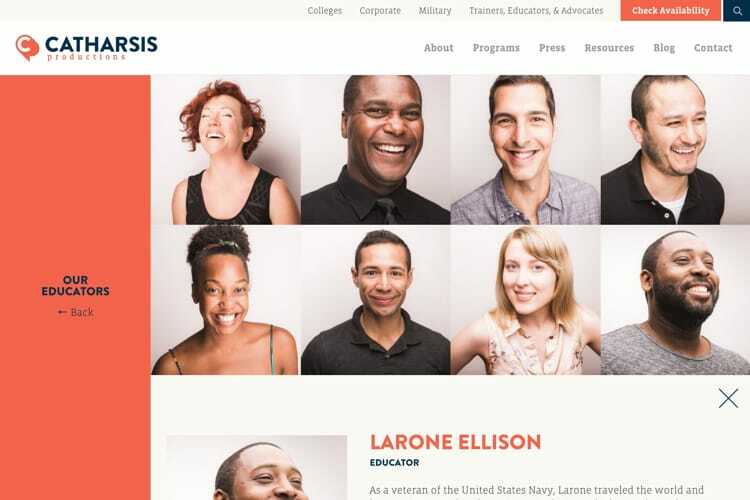 Currently, the three main customer groups that Catharsis serves are Military, Government, and Colleges. 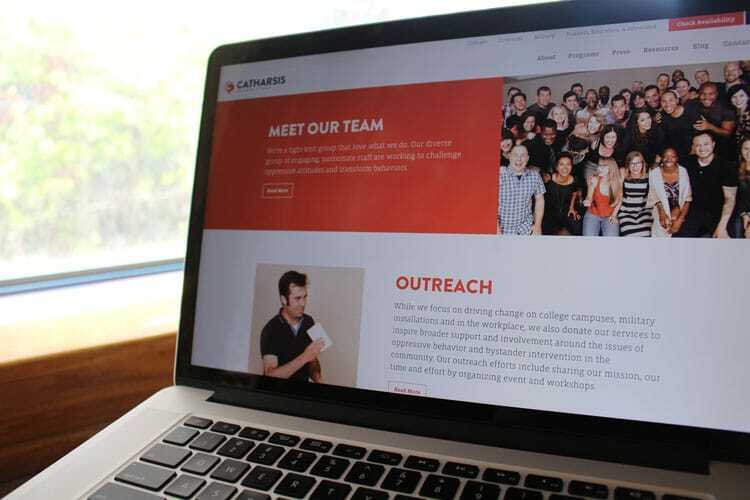 Catharsis wanted a new website geared toward helping them grow their business by attracting new clients as well as reinforcing their offerings to current clients. 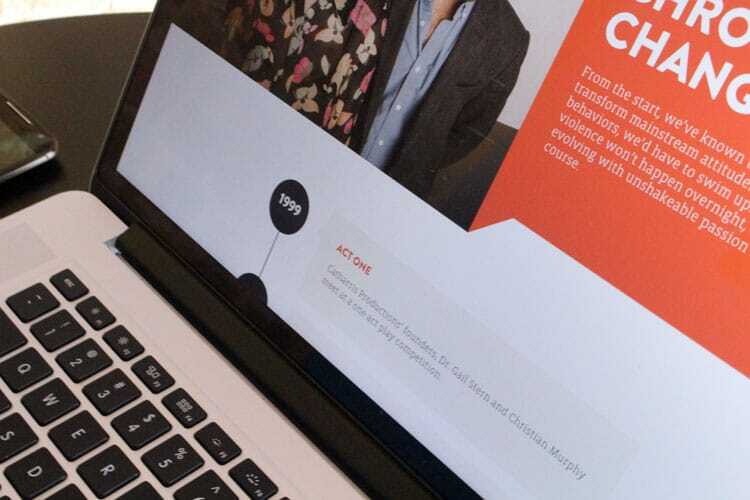 We met with a couple members of the Catharsis team to gain a deeper understanding of their vision for the new site. We began by digging into the company’s background, the different types of programs they provide, and their target audience. Next, we reviewed the problem areas in their current site. They felt their style need to be updated, it wasn’t mobile-friendly, updating content was a pain, and navigating through the site was difficult. Then we reviewed a handful of sites that they liked, just to get a feel for their aesthetic taste. By the end of this meeting we were ready to get to work! 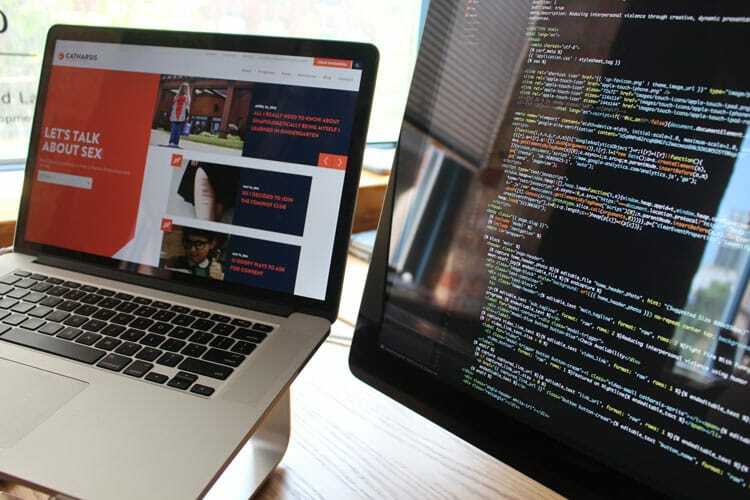 Our goal with the new site was to portray plenty of personality, edginess, and professionalism with a touch of humor to reflect the types of programs they offer to their customers. The color palette made is made up of a bold red and blue color that is contrasted with a cream and white. The typography throughout the site is made up of a bold sans-serif header font to grab a user’s attention, paired with a lightweight slab-serif font for the body copy that is very friendly, inviting, and legible for easy reading. The imagery included is a mix of both photography and illustrations. The photography shows the different faces of the Catharsis Productions’ team, which highlights their playful personalities and their high levels of energy. Whereas the illustrations help add a level of whimsy and humor which compliment the logo through its use of bold colors and simple shapes. There are also a few interactive elements such as the program preview cards, blog typing animation, and the team page that adds some movement and excitement to the page. 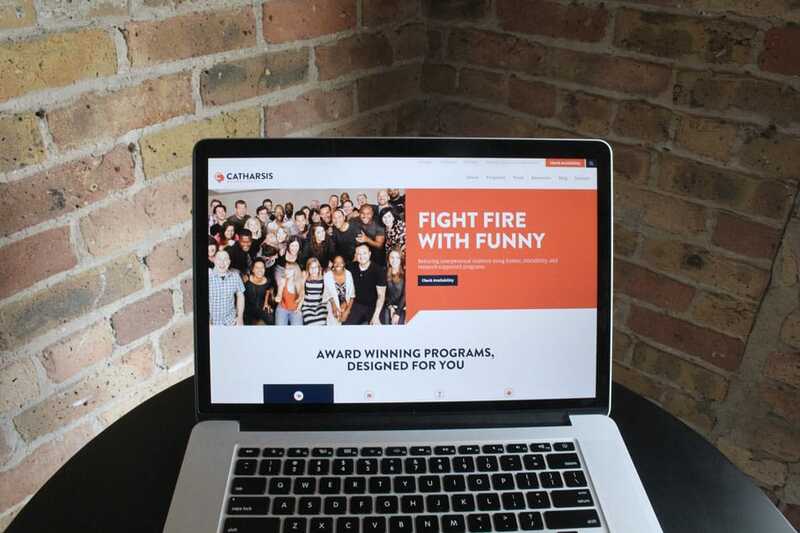 By focusing on Catharsis’ mission to engage their audiences with funny, relatable, credible, and innovative programs, we were able to design and build a website that reflects that message. The style is both professional and modern, yet at the same time unique and edgy—just like their programs. We reorganized the site architecture to make it easier for users to navigate and find the information that was relevant to their needs. We established a content hierarchy for each program that would include a brief description, media such as videos and images, features or topics covered in the program, key takeaways, testimonials, and other programs that pair well with each other. 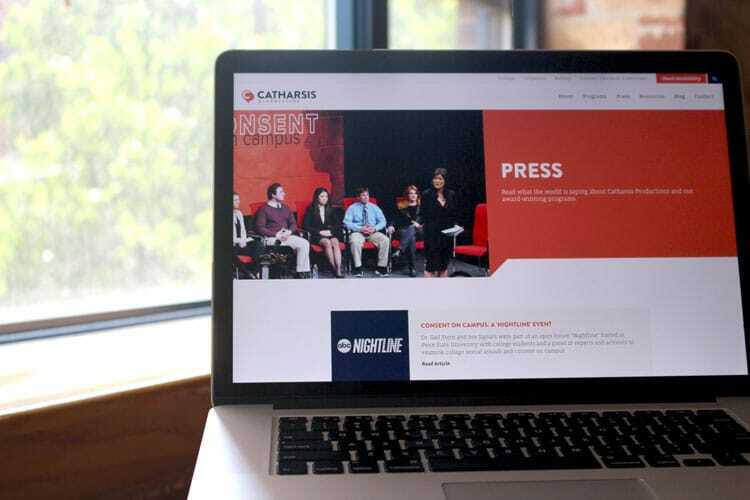 There are also several areas throughout the site where Catharsis can share various resources and blog about current events which not only reinforces their credibility, but also encourages their users to return to the site. With the website launched, we make ourselves available for any design or development help that the Catharsis team needs. 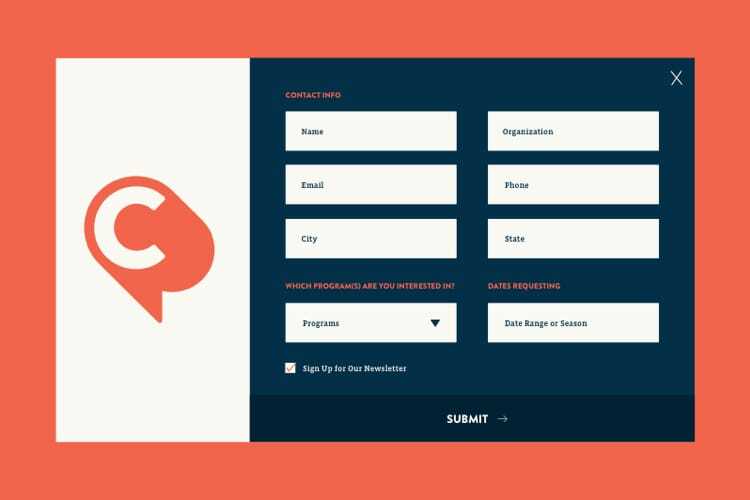 With the content management system we put in place, it’s easy for the Catharsis team to edit, add, or delete content. Whenever they need additional landing pages, custom templates, or illustrations, we’re always here to help. And with any new website it’s important to keep an eye on analytics and see which pages can be optimized further and increase traffic to the site.